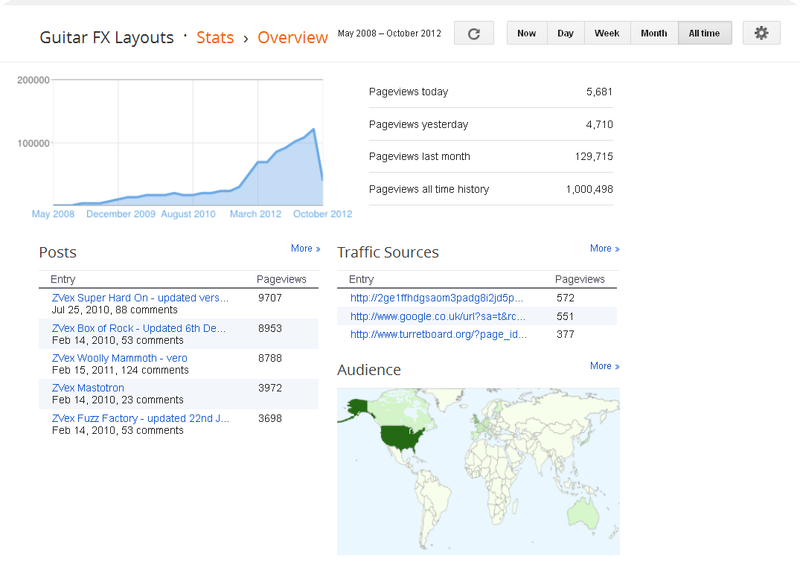 I had to post this because it's another site milestone. 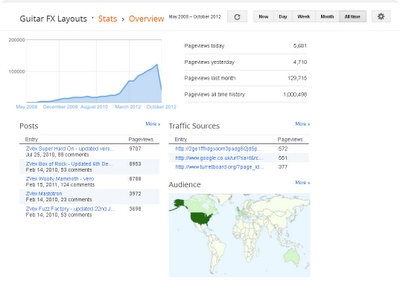 317 verified layouts, 7600+ comments and we've finally got to a million hits. Here's the stats page from the admin panel which show how much traffic has increased nicely since the blog opened in 2008. And look at the top posts, all ZVex! Wow! Congrats!!!! Speaking for myself, I learned SO MUCH using the layouts posted on your site. It allowed me to make huge steps in my learning while building pedals that I always really wanted to play. wow! cool Mark. you deserve it. IMO, you have the nicest vero layouts bar none. i think you've had quite an influence on the diy pedal community and a million hits is proff of that. congrats! Congratulations! Looks like you have some open markets to tap. I wouldn't focus too much on Greenland, though. Yup. Can't agree more on the learning issue. It's not even been a year since i finished my very first GGG Green Ringer kit. Now i've done +85 finished pedals and there is now over 35 tested boards just waiting to get boxed (i might not box every one). I've learned so much, but there is still more to know. You've really deserved the 1M hits. Thank you. Well done Mark and many thanks for your hard efforts. I visit your site EVERY day i've learned a lot in a short time. +1 I take a look each day at least once to see if there is any new layouts! As a builder who also loves his resistors laid flat your layouts are the ones for me! All your hard work is really appreciated, a big THANK YOU. Thank you for all the work you did here! well done Mark, not really a big surprise to me though, best diy fx layouts on the net. Excellent work Mark, I really appreciate all the effort you put on this web page, thank you!. Cool Mark!! Congratulations on the superb work. apparently there has been some kind of mis-calculation. I have been to your site at least a million times alone! Well Done! & thank you for sharing! "Why do all the diagrams stop short of showing us where the input and output connections are made? Which wires go to which terminals?" Or are they there and I just don't see them? the input and ouput goes to the 3PDT bypass switch. And yes, congrats on the hits. Keep Rocking to another Million! Congrats!! Your site is amazing. And I am here everyday! Congrats! Love your site, built at least 20 layouts from here so far, keep em coming! Congrats Mark, you deserve it....this site is my second home :).....keep up the great work.